Comprehensive blog on IGNOU BCA course. Check out information on IGNOU syllabus, assignments, results, projects and related links. Looking for the IGNOU MSW 2015 - 2016 Solved Assignments? Contact Harish Chandra at 9716980784 for quality IGNOU MSW 2015 - 2016 Solved Assignments. Harish Chandra has been completed MSW from IGNOU and have good experience in writing the assignments, projects and field work journal of IGNOU MSW and BSW. My cousin got good rank in the IPU entrance test. He wants to do BCA from the Vivekanand School of Information Technology VIPS. Can anyone tell me about the fees structure of the BCA course from VIPS Vivekanand School of Information Technology? There are total 6 assignments in the first year of the IGNOU. Contact me for more information on the IGNOU MSW Solved Assignments 2013. 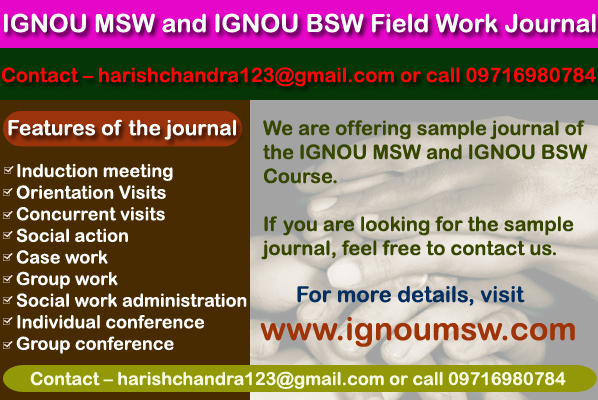 Looking for downloading the IGNOU MSW or IGNOU BSW field work sample journal work? We are offering sample journal of the IGNOU MSW and IGNOU BSW Course. If you are looking for the sample journal, feel free to contact us. Features of the field work journal of IGNOU MSW or IGNOU BSW course. Bachelor of Computer Applications (BCA) is one of the most famous professional courses offered by IGNOU. BCA course of IGNOU is specially designed for those students who want to make their career in IT field. Numbers of students enroll for IGNOU BCA course in each and academic year. Due to wide demand of IT professionals in India as well as in abroad, IGNOU BCA course becomes very popular among students. Read to know about more information on IGNOU BCA course. The IGNOU BCA program is planned for those students who want to make their career in the field of information technology. Anyone who has done 10+2 can enroll for this program. IGNOU BCA program offers theoretical as well as practical knowledge of computers and software technology. • 10+2 with Mathematics as a distinct subject. • 10+2 without having Mathematics subject with IGNOU CIC course. If you don’t have CIC certificate then you need to complete PPC course with BCA. Course duration: Min: 3 years and Max. 6 years. Course Medium: This course is only available in English medium. IGNOU program is divided in to six semesters. Check out each semester plan. You have to submit assignments of related subject in to your study center. The assignment significance is 30% while theory paper weight age is 70%. You can download latest IGNOU BCA assignments from IGNOU website. IGNOU offers two term end examination in each academic year. The exam is conducted in June and December months. IGNOU BCA results are announced after 2 months of exams. You have to submit a project in VI i.e. last semester of IGNOU BCA course. You can take help of your supervisor about project. IGNOU also offers MCA program through distance education. You can go for MCA from IGNOU or any other university. Using IGNOU you can pass out BCA and MCA in 5 years. Yes if you successfully completed BCA course through 4th semester then you can take admission in IGNOU MCA directly. This blog is designed for providing necessary information about IGNOU BCA course. Please check IGNOU website www.ignou.ac.in for more information on IGNOU BCA course. IGNOU B.Sc - Blog for students who want to pursue Bachelor of Science (B.Sc.) through distance mode in India. Blog managed by Harish Khulbe, creator of Sonia Vihar dot Com Website and Owner of Khulbe Web Solutions.